Arnoff Moving & Storage has been a long distance moving company since 1924. We are proficient at executing long distance relocations with our special equipment, resources and highly-trained professionals. Regardless of your relocation needs, our services ensure a successful and seamless transition to your new location. Whether you're moving from Massachusetts to Maine, Connecticut to Cincinnati, Florida to Fresno or New York to North Dakota, Arnoff can get you there. As a long distance moving company and agent of North American Van Lines for more than 60 years, Arnoff has the personnel, experience, equipment and communications technology to manage your interstate move. Our qualified sales representatives will provide you with an in-home estimate and devise your customized move plan. Our highly-trained and bonded packers and loaders will efficiently and securely pack and load your belongings. Air-ride trucks will reduce shock and vibration to your household goods during transit, ensuring their safe and undamaged delivery. As your trusted long distance moving company, Arnoff stops at nothing to ensure your move is executed to your preferences. 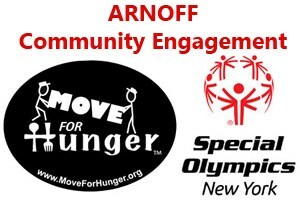 Arnoff is committed to providing comprehensive services and quality relocations. At Arnoff Moving and Storage, we are confident that our service performance will satisfy your relocation needs.